The full title of this book is actually, 1536 Free Waters and Other Blackjack Endeavors: Finding Profit and Humor in Card-Counting . The author is Glen Wiggy, an amateur card counter, and a mathematician. The book is part "how to", part memoir, and part miscellaneous stories that started out as blog posts at blackjackstories.com. This is NOT a book for someone starting out that wants to learn to count cards. Why? First of all the count he advocates is the Hi Opt 1. Now this is a fine count for playing against single or double deck games if you use a side count for aces. Glen is using this count, without the side count of aces, and using it against 6 deck shoes. He also divides his running count by half decks to get a true count. So he is using a weaker count that is more difficult to use. 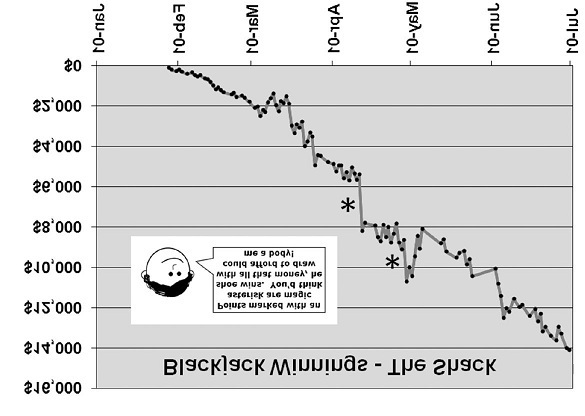 If you want a basic primer on how to learn card counting I would recommend Blackbelt in Blackjack by Arnold Snyder. I entered Santa Ana Casino around ten o'clock on a Saturday morning. I was betting $50 per hand with a $750 bankroll. Again, WHAT?! $50 isn't his top bet, it is his unit size. The fact this he never went broke is just incredible. Here is a graph of his first 5 months of play. 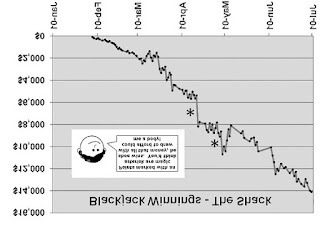 Now I'm sure if his graph had looked like this he would have quit playing long before the 5 months were up. What happened? Was it poor money management? Was it simply the result of a stinky boot? (Glen's term for a bad shoe. )Was there a simpler answer? Yes. Greed. I could have quit several times during the day, even toward the end when the count was unbelievably high. There is no rule, written or unwritten, that says you must continue to play when the count is high. Greed got the best of me. I know I keep saying this, but this guy is supposed to be a mathematician! Several times in the book he blames his losses on "getting greedy." No Glen, this is not greed, this is not understanding how to size your betting based on your bankroll. Something a guy with a masters degree in mathematics from the University of Arizona should understand. One of the stories in the book involves Glen wanting to buy a TV. He is ahead $1500 for the day, but he needs $1600. He wants to win the extra $100 so he decides to Martingale it. The Martingale is a betting system where you make a bet, and if you lose you double it, and if you lose that you double again etc until you go broke. Because ultimately you will go broke as no betting system can overcome a negative expectation bet. Of course he loses his $1500. I'm sorry, but this is a card counting book written by a ploppy. Richard, even with one ace, I respectfully want to thank you for putting significant time and effort into reviewing my book. Regrettably, I wish you would’ve mentioned some of the humor in it--that is my main selling point, not the strategy. The book is 80% humor and 20% basic strategy and intro card-counting. (By the way, I do use a side count of aces.) I didn’t go into the finer aspects of counting strategy and money management in the book because it is widely available elsewhere. I went for the funny! Please let me know if you cracked a smile at least once. Yes, my review kind of took off on the "how to part". There is a lot of humor in the book, and I did crack a few smiles. I actually found the most interesting stuff to be the memoir part. I would have liked to see more of that.